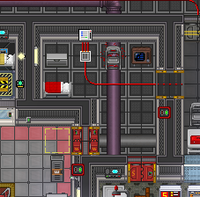 This is Beepsky's House, because Beepsky is so important that he gets his own room with a separate APC from the rest of Security for some reason. Nobody knows why he has a bed instead of a charging station. Still, it provides a security camera monitor for those who are not allowed in the security section... and know how to duck. There's also a crate of Beepsky's stuff in there, including his private journal (?) and relics of a bygone era. 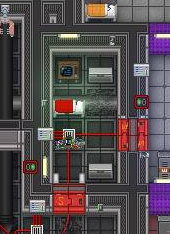 This is Beepsky's House, because Beepsky is so important that he gets his own room, with its own APC, separate from the rest of Security for some reason. Nobody knows why he has a bed instead of a charging station. Still, it provides a security camera monitor for those who are not allowed in the security section... and know how to duck. Beepsky still has his own little room, located in the Courtroom, but unlike newer stations, it's doesn't have its own APC. Not that it needs one; it's just a bed and a crate with his personal affects. Poor Beepsky. Officer Beespky never sleeps, but that doesn't mean he doesn't have a place he calls home! In fact, he makes residence in the general southeast of the station, in a quiet corner of the maintenance tunnel around Mechanics. Inside is a bed (no one knows why he has a bed instead of a charging station, but peculiarities like these can be excused in Beepsky's case), his private journal (? ), and relics of his role models. Officer Beespky never sleeps, but that doesn't mean he doesn't have a place he calls home! In fact, he has a house of sorts, called Beepsky's House, just right of the Brig. Inside is a bed (no one knows why he has a bed instead of a charging station, but peculiarities like these can be excused in Beepsky's case), his private journal (? ), and relics of his role models. This page was last modified on 21 October 2018, at 03:57.